within the rivet, and this cheesy deposit needs to be dug out with a dentist’s pick after chiseling off the surface oxide. 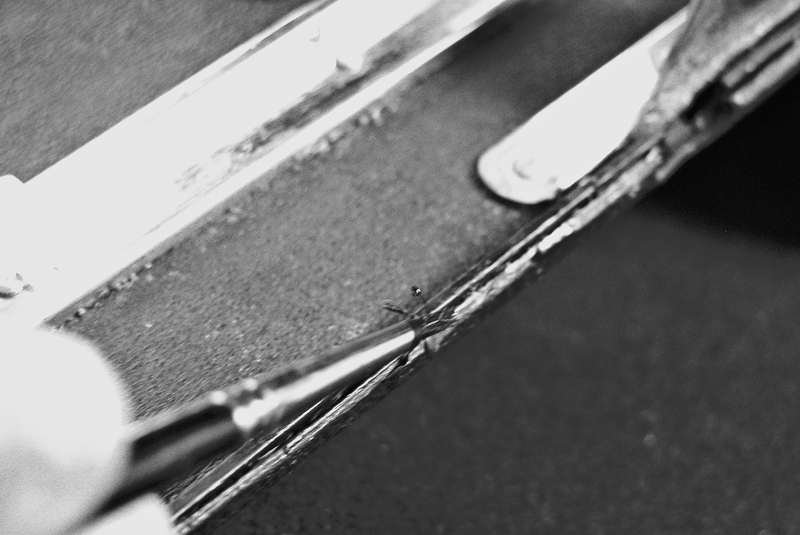 If the leather is securely stuck to the frame, an “X” can be cut over the blister with a sharp scalpel or razor blade and the oxide scraped out. Thomas Tomosoy describes this process in “Restoring Classic and Collectible Cameras” on page 37. 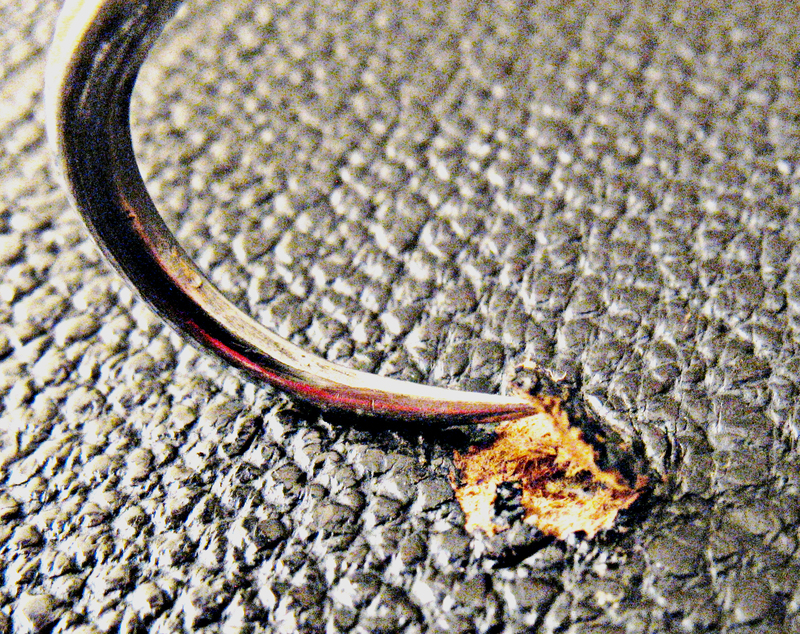 After copper oxide deposits have been removed, either by lifting the leather covering or by cutting X’s over the bulges, a thin layer of tacky craft glue is spread on both surfaces and allowed to dry slightly. 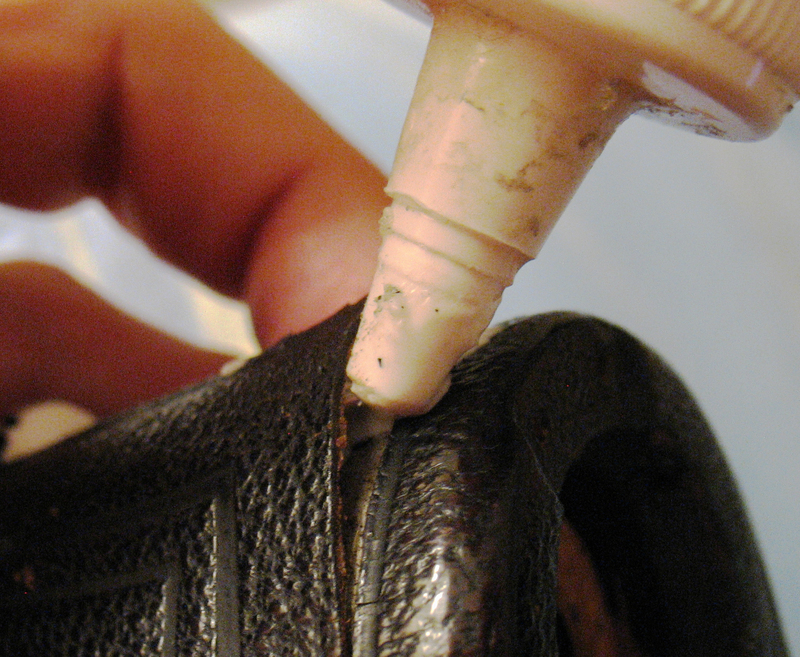 Then the leather is pressed firmly back into place and massaged gently to remove any air bubbles or glue puddles. 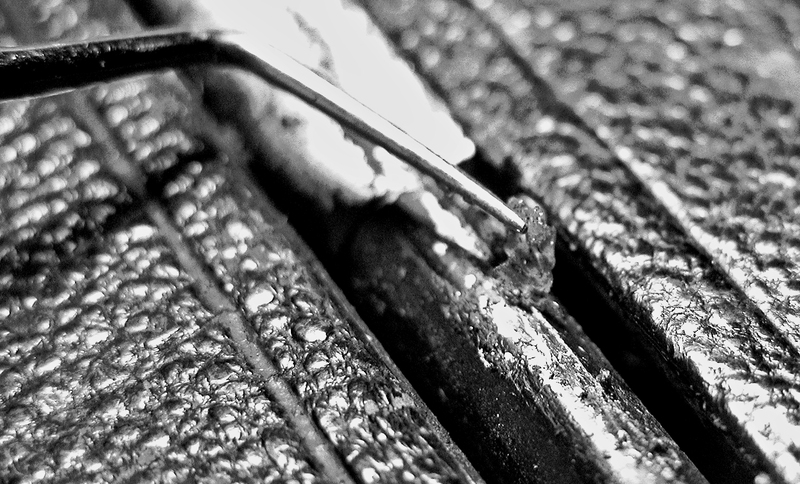 Carefully press down on the bumps in the leather formed by the copper oxide to flatten and reattach these areas to the metal. Beware of exerting too much pressure on the leather with hard instruments, as this can flatten the grain once the leather is moistened by the glue. As with many vintage cameras, the leather on the front plate of the Ansco bends up to cover the flange around the edge of the plate. Make sure the leather covering around this flange adheres closely as the glue dries; this can be accomplished by massaging the leather edge as the tacky glue becomes progressively more sticky during drying. Once it is thoroughly soaked, the leather becomes elastic once again and can easily be re-stretched. 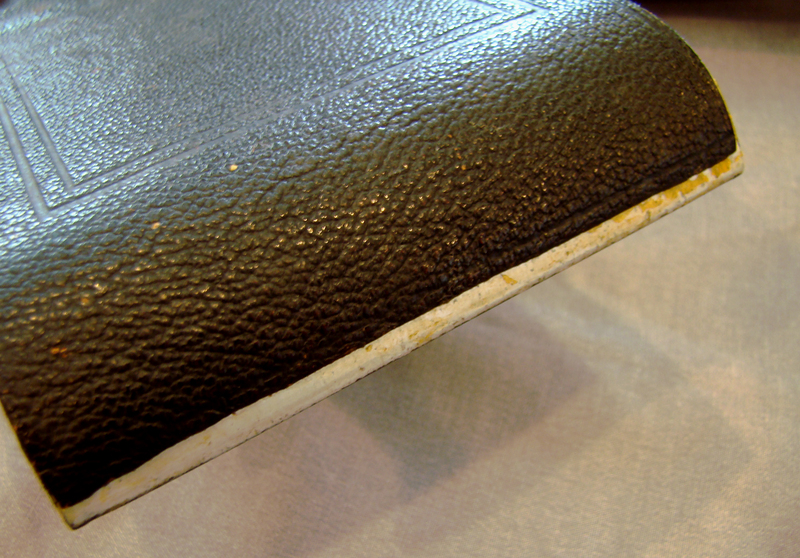 The old glue appears as a slimy coating on the underside of the leather and can be readily wiped off. The leather and frame are then both wiped dry, a thin layer of white tacky glue is spread on the metal back, and the leather is gently pressed down and massaged into its original configuration. back plate, in the slots where the back plate inserts into the camera, and along the edges of the base plate. Painting before leather restoration allows the paint to adhere and dry before the surface becomes oily from the creams used to restore the leather. 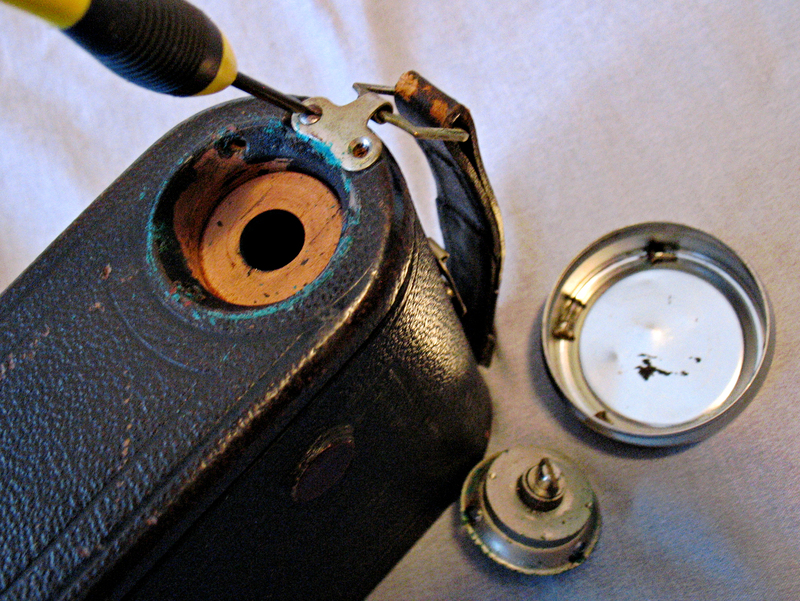 removable external hardware pieces, including the strap, winding knob and film support inserts are removed. Once the leather is cleaned and the hardware removed, leather restoration can begin. 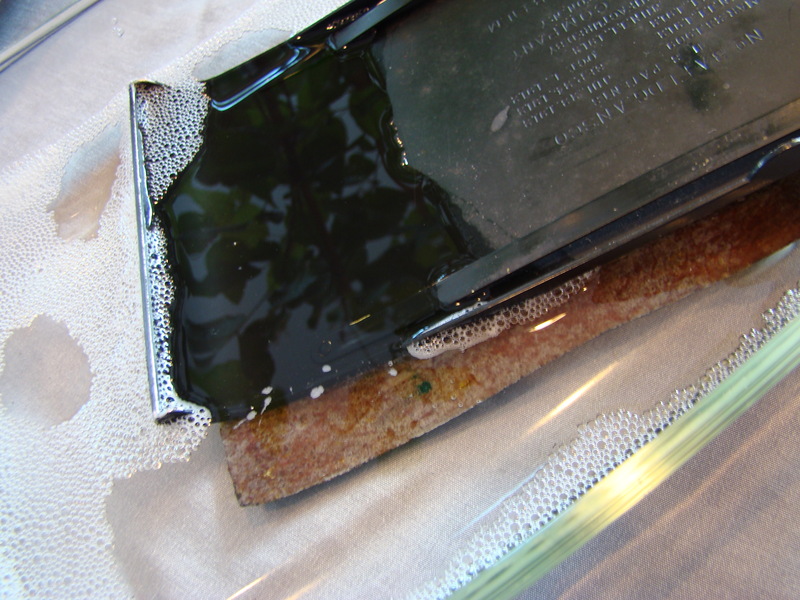 The covering is carefully examined and any loose edges are glued down. Leather Balm, a cream leather treatment, to rehydrate the fibers , followed after drying with Dyo Visco, a solvent-based waterproofing agent. If these products are not readily available, similar treatments can usually be identified by contacting your local shoe repair establishment. The surface is then given a coat of brown shoe polish and rubbed to a lustrous finish by hand. lens wrench to be used. 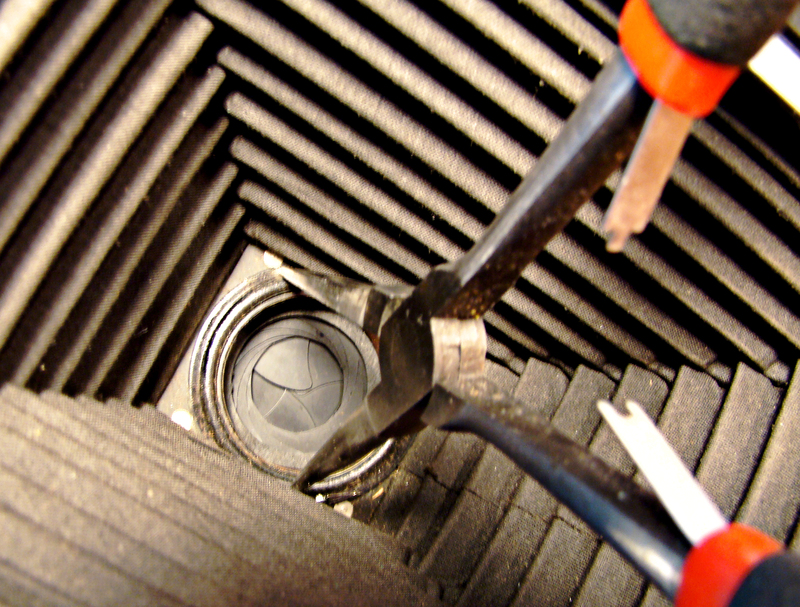 The ring can be removed by partially extending the bellows and use a long pair of needle nose pliers with fine tips as an improvised lens wrench. 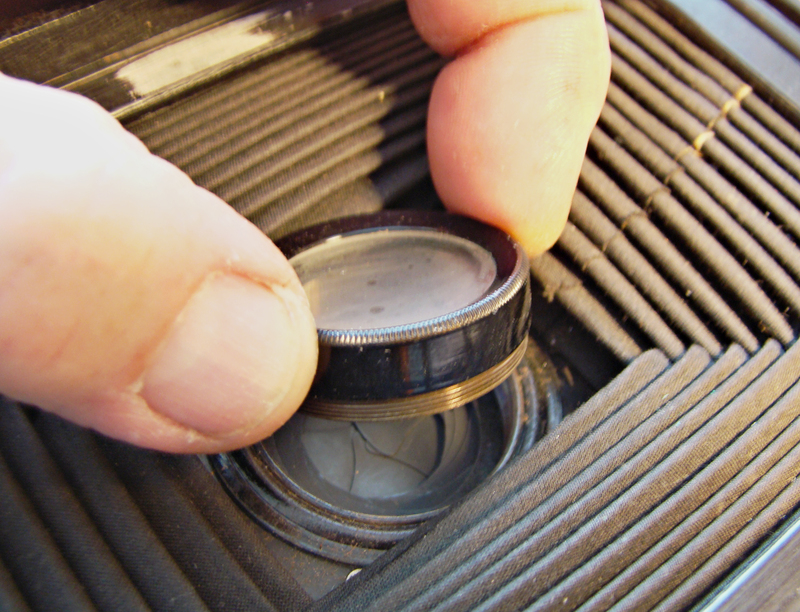 This is an awkward operation that needs to be done with some caution, as it is easy for the pliers to slip and punch a hole in the bellows or damage the shutter. 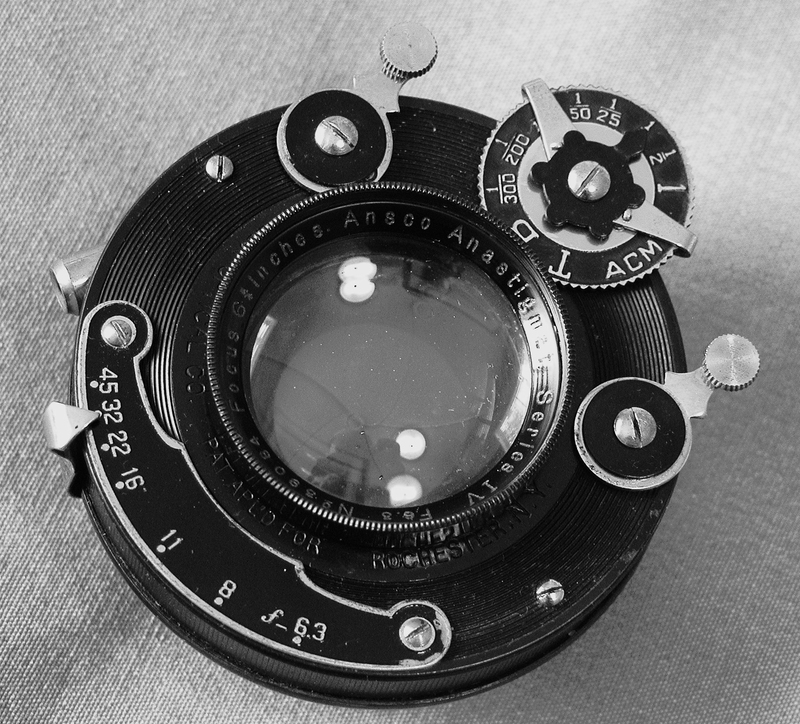 On the Ansco, it was possible to simply hold the retaining ring steady while the entire lens and shutter assembly was unscrewed from the front. On many cameras, either there is an orientation pin, or the front standard is sufficiently cluttered that the whole assembly cannot be rotated, and the retaining ring must be laboriously rotated from the rear. 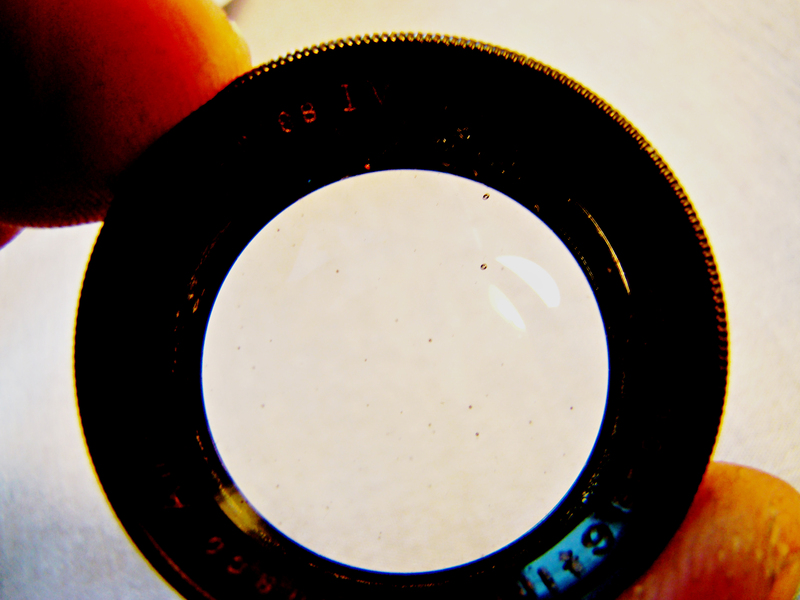 surface that would be exposed to the moister inside of the camera) consistent with fungus growth on the glass. This can best be seen with a strong light shone obliquely across the back of the lens. 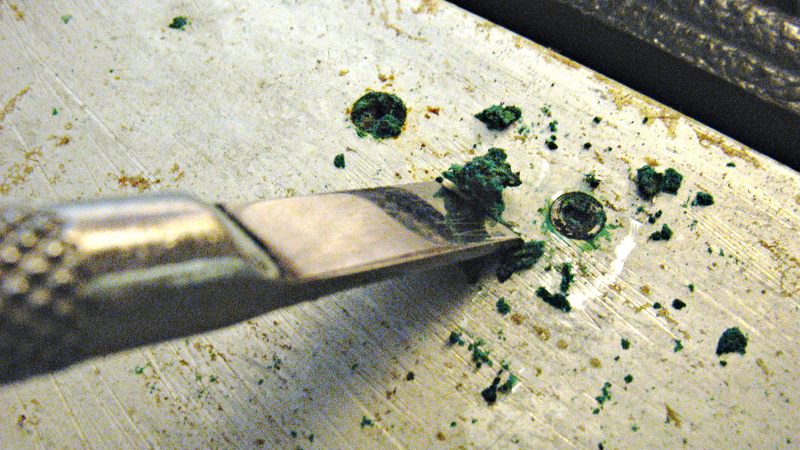 Fortunately, much of this material was removable by a determined cleaning with Windex on a Q-tip. 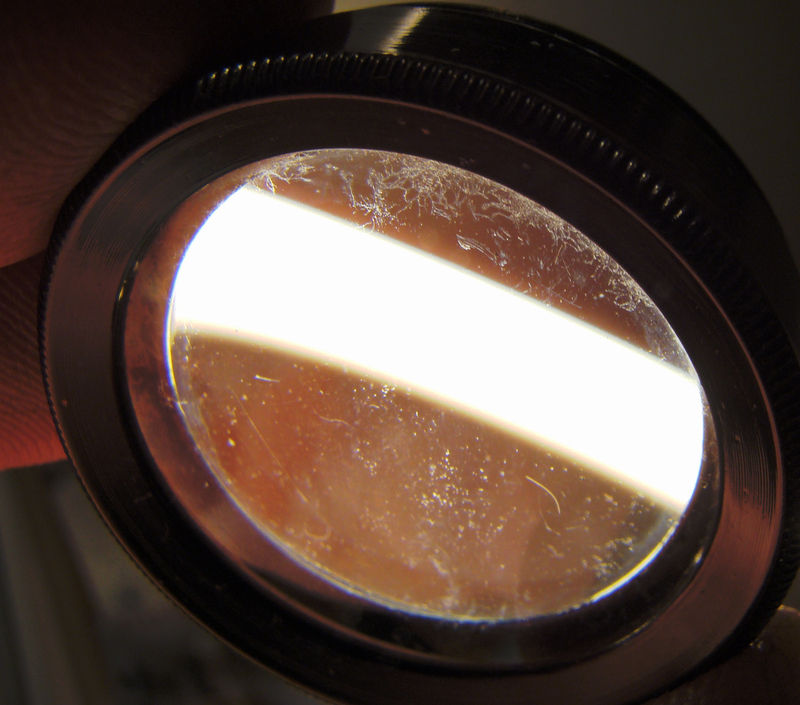 A patchy change in the color of the glass surface was still visible to careful examination by reflected light, but the filaments (fungal hyphae – See “Lens Fungus”) were able to be scrubbed off successfully. 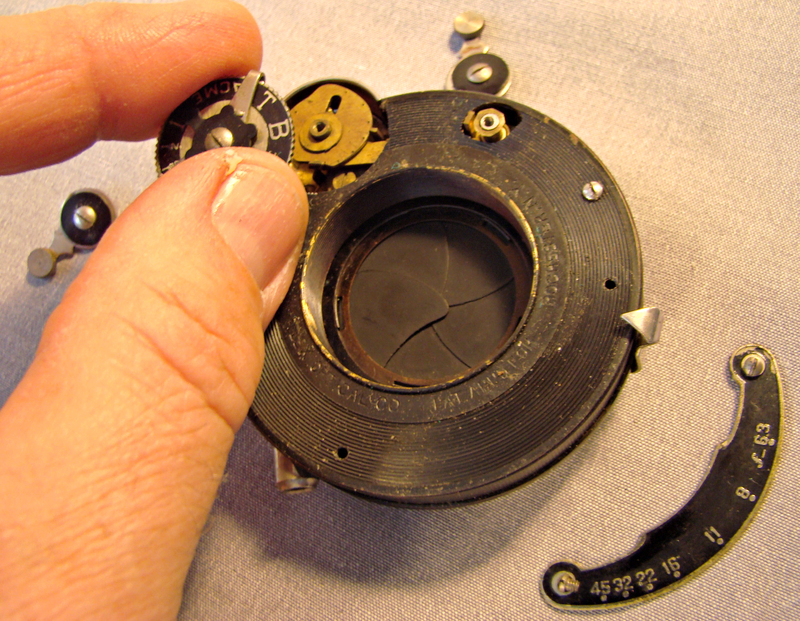 the action of the shutter mechanism by shifting the two small levers visible on the left and lower right of the cam. Also note the small slot visible to the left of the cam housing. 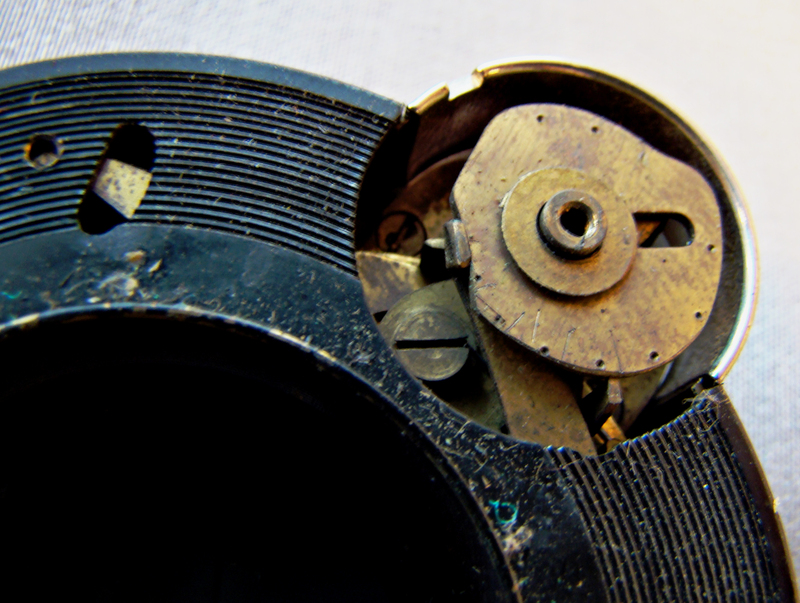 The brass lever visible in this slot is a part of the shutter release lever; it is moved by a small post on the back of the shutter release lever to fire the shutter. 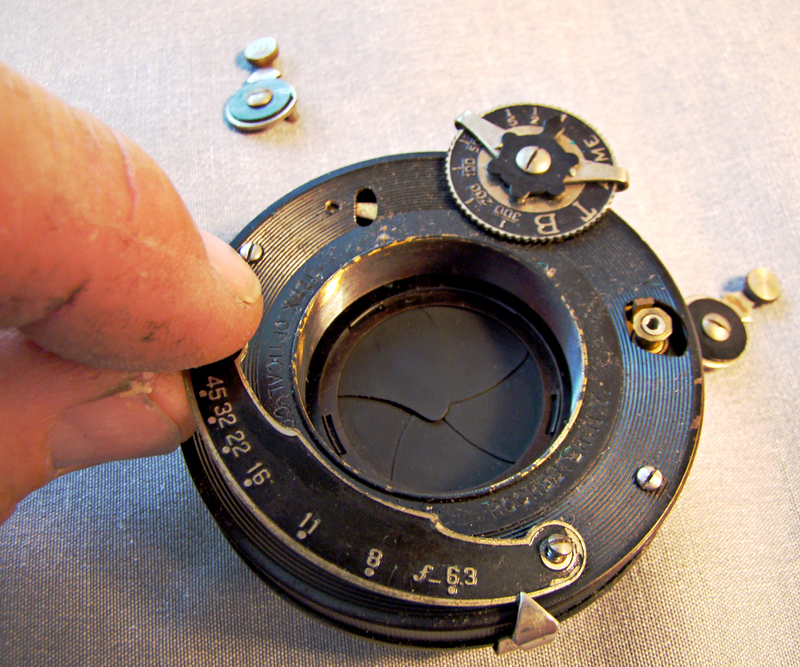 removing the two screws on the front panel, exposing the mechanism of the shutter. The slow shutter speed movement is to the lower right, while immediately above is the movement for speeds 1/25 sec and above. 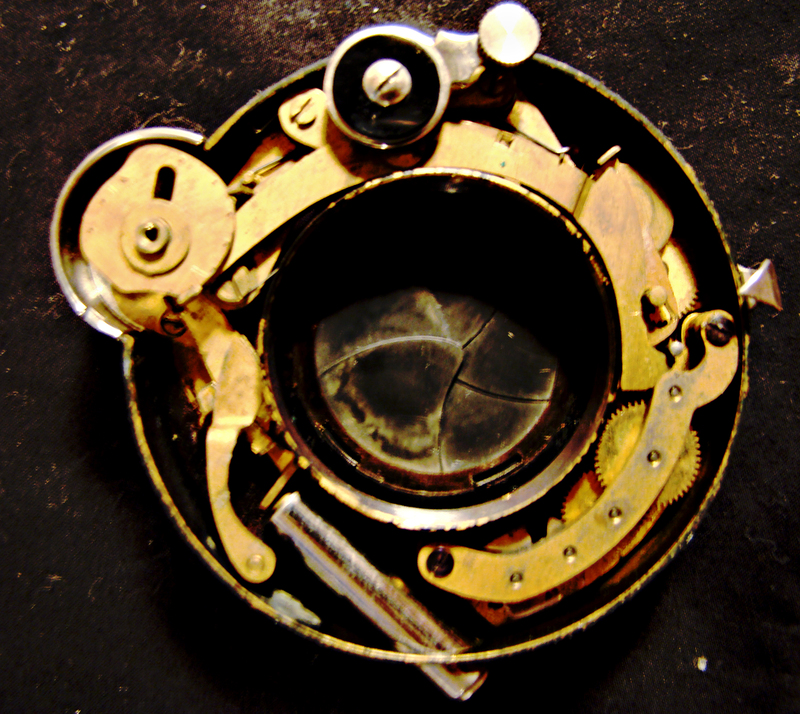 The large chrome-plated cylinder in the lower left accepts the cable release and abuts directly on the shutter release lever, which is immediately above. Since the Acme shutter uses no lubricants, it can be cleaned with dilute isopropyl alcohol in a small ultrasonic cleaner and then allowed to dry. This procedure should NEVER be used on any shutter that requires lubrication, and one must use solvents carefully, as many of the shutter blades on early twentieth century cameras were made of non-metallic materials that can be readily damaged by concentrated solvents. Cleaning in this fashion and judicious application of a small amount of graphite powder improved the performance of the faster shutter speeds, but the lower speeds were still approximately twice as long as the indicated values, probably due to weakening of the drive spring over many decades. In the absence of detailed manuals, the decision was made not to disassemble the shutter mechanism further. largely intact, its polish was merely touched up with a light application of shoe polish, and the shutter was reassembled. Step 6: The Interior: With the shutter assembly removed, the next step involves polishing – and more polishing – the chrome front standard and rails, followed by restoring the luster of the bellows and polishing and cleaning the interior leather and wood. Since the front standard is a complex structure largely held together by rivets, it can only be disassembled to a limited extent, and polishing is a fussy and time-consuming process. 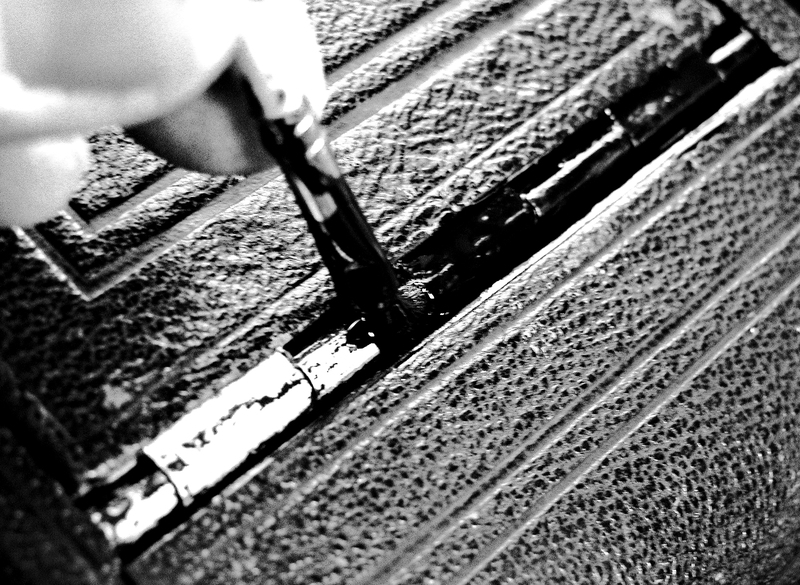 The Dremel helps, but in a structure of this complexity, much of the work must be done carefully by hand. The three screws holding the viewfinder are removed, and the entire chromium-plated front standard, including the complex folding vertical and lateral front feet, is polished with Flitz, Q-Tips, and a cloth. 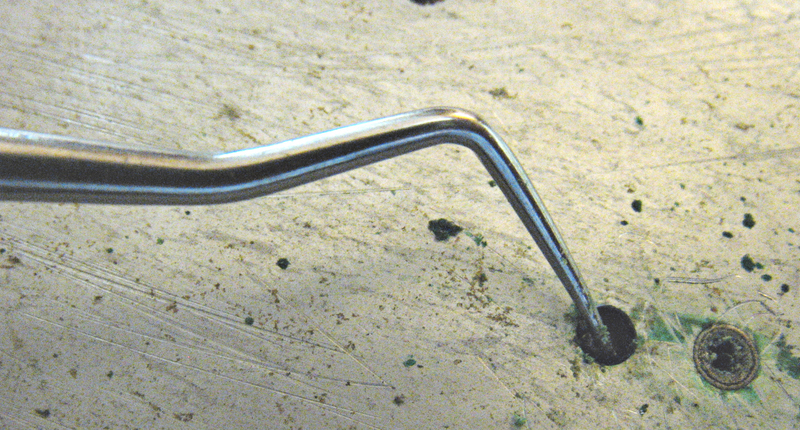 Once this is accomplished, the small stop on the bottom rail is removed (carefully noting its original position), allowing the front standard to slide forward and be lifted off the rail. Tomosoy, Thomas. “Restoring Classic and Collectible Cameras.” Amherst Media, Buffalo, New York, 1998. This entry was posted in Restoration by randcollins. Bookmark the permalink. Thanks for the restoration comments. I am looking forward to the leather step. I haven’t been too successful so far. I love the photos and now I know what else to do with the dental tool! Just picked up an Ansco 3A with extra back for plate film–and a few wooden film holders! All seem to be in great shape except for the leather, so this guide to restoring the leather will help bring this showpiece camera back to life! Thanks!